ACURAFLEX CREAM (100 ml) is to be applied directly to the skin, at a painful, swollen, stiff or sore spot, several times a day – as needed. Before use, be sure to wash your hands and dry them properly, press the pump on top of the bottle 3 to 5 times for extracting the right dosage of cream. Rub the cream into the skin and continue massage for a few minutes until the cream is completely absorbed. You need to achieve a slightly higher skin temperature so that absorption of the active ingredients of Acuraflex cream is as effective as possible. Wash your hands after use. If you have cream on your hands, do not touch your eyes and face. Acuraflex cream is not intended for facial use. Acuraflex cream is for external use only. Keep it in a dry and dark place, out of the reach of children, at temperatures above 10° C and below 25° C.
ACURAFLEX CAPSULES (60 capsules) are to be taken twice a day (in the morning and afternoon) during or after a meal, with enough water. Acuraflex capsules do not contain any ingredients of animal origin, and as such, capsules are suitable for Vegans and Vegetarians. For optimal results, apply capsule therapy every day without skipping, for at least three months. The contents of one package of 60 capsules are sufficient for 30 days of use. Acuraflex capsules do not cause addiction and have No Side Effects, so you can use them for as long as you feel necessary. Capsules are for oral use only. Keep them in a dry and dark place, out of the reach of children, at temperatures above 10° C and below 25° C. Expiration date is printed on the packaging. Content: 60 capsules are enough for 30-day therapy. 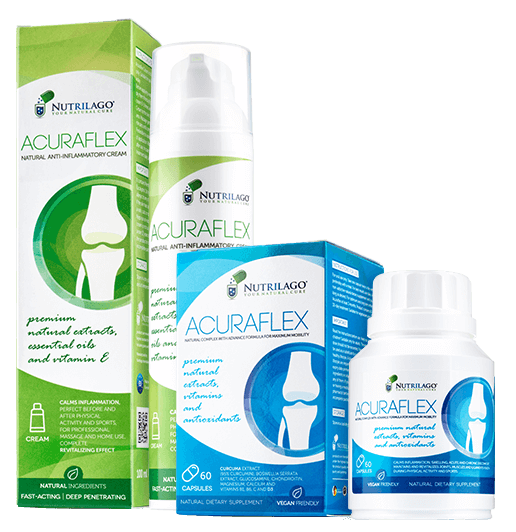 > Check price and order your Acuraflex cream and capsules here.